Walk through almost any English woodland during late Autumn and you are likely to find the spiky green fruit of the horse chestnut tree. Broken open, this fruit will reveal beautiful, dark, shiny nuts known colloquially as 'conkers'. For centuries conkers have been collected by children who thread them onto knotted strings and use them to swing against an opponent's conker until one, or both, have been smashed to smithereens. 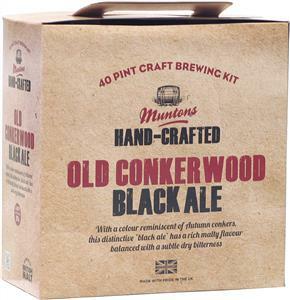 Old Conkerwood Black Ale is a distinctive, dark coloured ale which reflects the rich, burnished colour and heritage of the conker. The ale's aromatic yet hoppy character is neither of a porter or a stout. With the eyes closed, Old Conkerwood carries the pleasing dry bitterness of traditional strong English bitter, yet the specially selected, coloured malts used give the beer a colour and character all of its own.